It has impressed me lately how active the Richard Burns Rally (RBR) modding community is in building new high quality mods despite the now old age of this rallysim. A very good example of this is the NGP plugin from WorkerBee (GVR Community), now version 6, but also the staggering amount of new deliveries, cars and tracks. Especially because of this fascinating plugins and mods, the quality of RBR as a rally simulator is getting better and better. But especially for the Czech tournament plugin (RBRTM) it is a big challenge for new users to install and configure all plugins and mods. I had the idea a long time ago to develop EasyRBR in order to make installing RBR with all necessary plugins and mods as simple as possible. Even though I am not a professional programmer, I thought it would be a nice challenge to develop EasyRBR myself. After a first start, there was immediately a major challenge to find a suitable cloud environment for storing and managing the many gigabytes of data. This put the construction of the application on a low level but at the end of 2018 I found a partner in Holland. After that it made sense again to continue with the construction of EasyRBR. 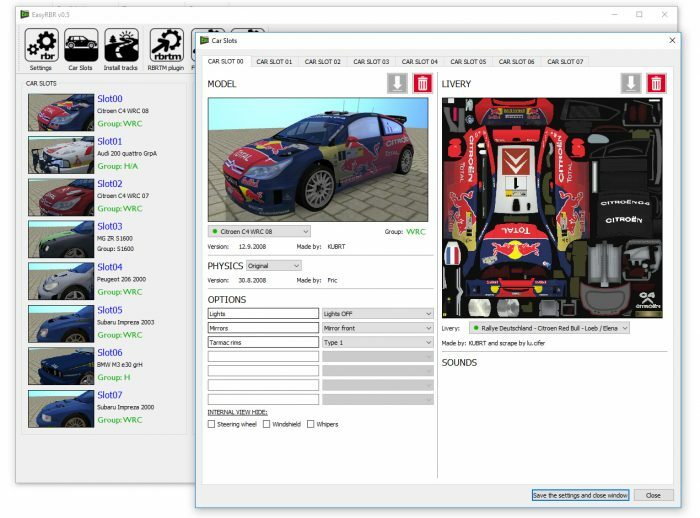 As you can see on the picture above the car and livery management module is ready. I am working on the car sound management at this stage and I hope to finish that soon. On my computer the application works without any problems but that’s of course no guarantee that it works well on someone else’s computer with perhaps different operating systems and internet acces. I could use some help soon, so if you would like to help me test EasyRBR in this early development phase, please let me know. Thank you for working on this that will help to maintain live this piece of art that RBR represent. If you need some help in testing the interface i will be glad to participate. Again thank you in advance to consider..
Good job, we will wait for test alfa impatiently! amazing and impressive work !!! It’s will be a great help to many RBR fans. If you seach for testers i can help you. Wow great addon and great work!! !